Flexible space for small-sized gatherings. Flexible space for medium-sized gatherings. Located on the west end of the library, behind the restrooms. Small, one area room used for smaller groups. Flexible space for medium-sized gatherings. Adjacent to public restrooms. Flexible space for small- to medium-sized gatherings. Space ideal for large events and community gatherings. First Floor adjacent to the parking lot. Ideal space for small groups. Second Floor, Southeast side of building. Flexible space for smaller gatherings. First Floor adjacent to the elevator. Flexible space for small gatherings. Small square room with double door entry. Flexible space with access to West Lawn. Flexible space for medium to large gatherings. Is open to Courtyard for outside gatherings. 1,861 square feet. Flexible space for small gatherings. 625 square feet. Large room, set apart from main body of library but connected by entry rotunda. Used for most events, both library-sponsored and by outside groups, and used for long-running art displays. Patio doors open onto parking lot and grassy area. Flexible space for large gatherings. Located on second floor of the library. Patrons can take the stairs or elevator located in lobby. Meeting rooms must be requested at least two (2) weeks prior to the requested date. Each group may schedule 1 (one) meeting per month with a maximum 4-hour limit. Groups may not use the rooms for ongoing meetings for longer than 3 (three) months before rebooking; however, tentative bookings may be available one year in advance at the discretion of the Branch Manager. Payment of 100% of applicable meeting room fees shall be required at the time of the booking, at least two (2) weeks prior to the date. A BOOKING WILL NOT BE CONFIRMED UNTIL ALL FEES ARE PAID. Flexible space for small gatherings. Located on second floor of the library. Patrons can take the stairs or elevator located in lobby. Flexible space for medium-sized gatherings. High ceilings and one wall of windows. Flexible space for large-sized gatherings. Flexible space for medium-sized gatherings (approximately 1,000 square feet). A large gathering space, approx. 1,762 square feet in size, that opens to an outdoor patio. Flexible space for medium-sized gatherings. Small stage area. Adjacent to public restrooms. Flexible space for smaller gatherings. Larger space for large groups or workshops. Front of library entrance. Flexible space for smaller gatherings; can be divided for smaller groups. Flexible meeting space located in the lobby area near the parking elevator, courtyard, and Library Shop. This space must be requested at least 30 days prior to the event date. Renters are required to use a caterer from the Library’s Exclusive Caterers list. State-of-the-art theater and performance space with floor to ceiling folding glass doors expanding into the outdoor Courtyard. Check out a Google360 view here. Neil Morgan Auditorium layout map here. Special events spaces must be requested at least 60 days prior to the event date. A minimum rental rate of four hours will be charged for this rental space. Each additional hour, including load in and load out time, will be charged the hourly rate. Additional ancillary fees based on the Library's current fee structure may be charged depending on the event to recover after hours expenses or costs for additional staffing, security, audio visual needs or cleaning. This flexible rental space has stunning views of San Diego Bay, East Village, and Petco Park. Rental includes access to the catering prep space, serving area, and adjacent Epstein Bay View & Sunset View terraces. 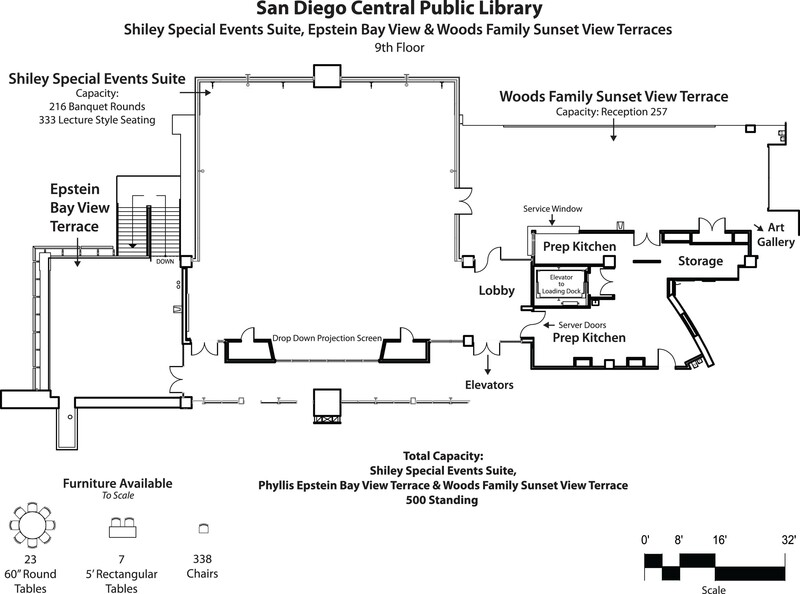 Shiley Special Events Suite layout map here.